The Ford class incorporates advancements in technology that make the carrier more capable and more efficient, while also providing it with the ability to implement future advancements in technology with relative ease. With increased capability and reduced total-ownership costs – through, e.g., manpower reductions and innovations, such as greater electrical production from the nuclear power plant, the use of fiber-optic networks, improved corrosion control, and the use of new, lightweight materials – CVN 78 and future Ford-class carriers package increased warfighting capability and enhanced survivability in a platform that will keep pace with the threat through the course of the 21st century. THE ISLAND on CVN 78 is smaller and further aft than that of previous carriers, increasing space for flight-deck operations and aircraft maintenance, thus enabling the ship and air wing to launch more aircraft sorties per day. 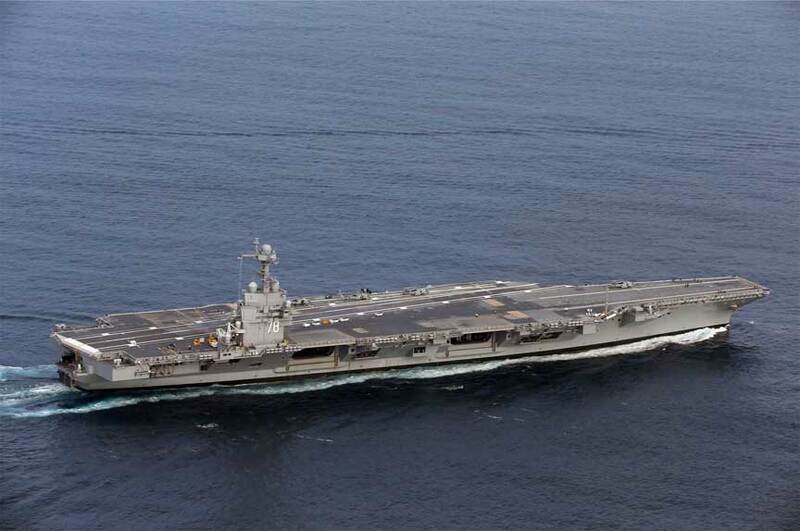 CVN 78 has replaced legacy steam‐powered systems with electric-drive components. With three times the electrical-generation capacity of any previous carrier, the ship is readily susceptible of future modernization with new and emerging technologies throughout its 50-year service life. A LONGER TIME between maintenance availabilities allows for increased steaming days over the life of the ship. Its IMPROVED SURVIVABILITY includes improvements in hull design, firefighting systems, and weapons stowage. Improved WEAPONS AND MATERIAL HANDLING are provided by the Advanced Weapons Elevators, which provide faster movement of ordnance from magazines to aircraft. FORD-CLASS AIRCRAFT CARRIERS include new and innovative technologies to launch and recover (land) aircraft. The Ford-class electromagnetic-powered aircraft launch system (EMALS) offers numerous advantages over the traditional steam-powered catapults of the Nimitz-class carriers. EMALS provides for more accurate end-speed control, with a smoother acceleration at both high and low speeds. The system also possesses the necessary energy capacity to support an increased launch envelope and a capability of launching both current and future carrier air wing platforms – from the lightest unmanned aerial vehicles to heavy strike fighters. The Advanced Arresting Gear (AAG) system provides Ford-class ships with the ability to recover both current and projected carrier-based, tailhook-equipped aircraft, and is the follow-on system to the Mark-7 system of the Nimitz class. AAG allows for the recovery of a broader range of aircraft and, through its greater control, reduces the fatigue-impact load on the recovered platforms. The AAG architecture includes built-in test and diagnostic technologies. Ford-class carriers include QUALITY OF LIFE enhancements, such as improved berthing compartments, better gyms, and more ergonomic work spaces.